Some of the most popular employee time and attendance systems use a plastic badge (a wallet sized card) or other fob as a punch in method. Many of these systems are Proximity driven, meaning they have a radio frequency identification (RFID) transceiver built into the hardware. Additional badge configurations may include Barcode, Magnetic swipe and HID. Most of these time clock terminals have numeric keypads to allow for option personal identification number (PIN) code entry method as well. Time tracking security can be enhanced by issuing badges (and refraining from issuing PIN codes) and implementing a policy whereby employees are required to carry their badges at all times. While time clock fraud can be costly; in many instances “buddy punching” is a crime of convenience. By spot checking or overseeing the clock, administrators can create an atmosphere that cuts down on such theft. Compumatic XLS-21 Proximity/Pin Attendance System is WiFi enabled, comes ready for 25 employees and is upgradable to additional supervisors, employees, or multiple clocks. This easy to use system includes 90-days of Free Technical Support. Employee punch IN and OUT by either using the clock's keypad or RFID Badge (not included). Pyramid TimeTrax EZ Proximity Ethernet time clock system offers touch-free Proximity Badge clocking with RFID Proximity card. Complete kit includes 50 employee TimeTrax Software (upgradable to 500). Multiple station timeclocks can be connected to your LAN or WAN network allowing employees to punch in and out from any time location. 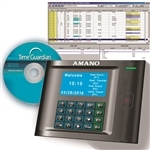 Complete time clock kit includes proximity terminal, software, and 15 employee badges. The TimeTrax Elite Proximity System comes ready for keeping track of 50 employees (upgradeable to 6000) time and attendance. Has ethernet connectivity with Windows based software allowing for simple exporting of reports to your payroll provider. Coordinates easily with other Pyramid clocks.